I know, I know… it’s silly to ask. You would immediately jump into the water and save the young girl’s life! Your cool watch, your fancy shirt and your new shoes would probably get ruined. You would be the hero who saves that girl’s life; because if you were in the right place, at the right time, you would do the right thing. Now let me interrupt this random conversation with a huge FYI: if you earn the typical income in the US, and donate 10% of your earnings each year to the Against Malaria Foundation you’ll probably save dozens of lives over your lifetime. That’s at least 12 drowning girls saved. Between now and the day you die. Tell me now, what are you going to do? Sitting on a throne, dressed in white, watching humanity destroy itself. That’s really good news for us. But it is also an invitation to surrender. Jesus left his privilege for the sake of the under privilege. And now, it’s our turn. In 2009 I went to the Republic of Niger and spent a week in sub-Sahara bush. This area is among the poorest regions in the whole world. We went to share the love of God and assist a local ministry. We did everything from feeding children, to handing out multivitamins, sharing the stories of Jesus with our Muslim friends and praying for the sick. While we were there in a remote village, we heard of a young man who had died from a common cold. And then I literally lost it. I got into the car and began to cry uncontrollably. Our team had spent eight hours under a tree in 100+ heat, trying to smile for the long line of malnourished people who waited for food, Jesus and medicine. I cried because I was angry at my own selfishness. I cried with disappointment because God had not sorted out the famine. I cried because a man had died from a common cold. Just a freaking common cold. It’s taken me since 2009 to realize that I can’t save everybody (duh) but I could save at least 12 (and maybe more). This summer, I moved with whole family to Puerto Rico. Two powerful hurricanes decimated the island last fall. And for the last 10+ months I have been flying in and out, with multiple teams, from multiple churches, loving the people of the Caribbean with words and action. And action is the key word here. Trust me, I’m not talking about becoming “saviors” on the spiritual high of good deeds. Neither am I talking about salvation via works, or trying to earn God’s love. This is not about things we HAVE do. This is about the things we GET to do. You my dear reader have been fully empowered to change the world. *And God save me from just trying to hype you up! This is your calling. To be an activist. To move out of the comfortable to access the glorious. Serving the least. Loving the poor. 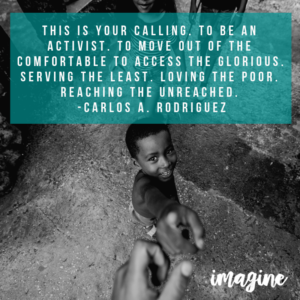 Reaching the unreached. And I’m not telling you because I’m an evangelist and my job is to guilt you into evangelism. I’m telling you because I almost stopped believing in God, and then I went into prisons (and while telling sexual predators that God loved them… I started believing again). But I’ll tell you that story at the conference. Notice that Jesus listed out some of the “drowning” in front of us (and even claimed himself to be one with them). Yes, social media is exposing us to unimaginable pain, natural disasters, never-ending wars and “drowning girls” all around the world. And I know you’ve heard what the right thing to do is. But every once in a while, we all need a reminder to go ahead and do it. Don’t miss Carlos’s keynote address at the Imagine Conference this November. Register now!